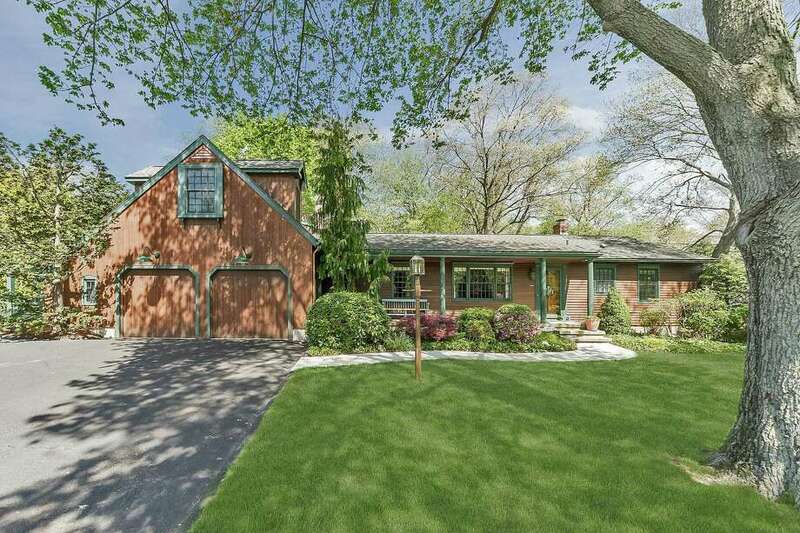 A modest ranch house at 104 Putting Green Road was expanded, renovated and re-imagined by the current owners who created a 2,446-square-foot custom-built colonial ranch. FAIRFIELD — A modest ranch house at 104 Putting Green Road was rather non-descript when it was first built in 1955. The current owners, one of whom is a professional builder, expanded the house tripling the footprint. They added a second floor to one portion of the house, and they gave it many features and characteristics that make it unique. Their modifications to the original structure and construction of a new addition created a 2,446-square-foot custom-built colonial ranch-style house. They also created a private and peaceful oasis in the heart of a residential neighborhood. The house is positioned on just under a half acre property in the Stratfield section of town where many of the properties are only a quarter of an acre. The good size backyard has a flagstone patio surrounded by perennial flower beds and an English garden. There is plenty of room for entertaining, child’s play, and to install an in-ground swimming pool. In addition to this backyard the house has access to many local recreational amenities. It is within walking distance to Lt. Owen Fish Park, which has ball fields, tennis courts, and a picnic area. The 170-acre Lake Mohegan has swimming, hiking trails, playground and snack bar. The house is only a block from North Stratfield School. Recreational opportunities continue at any one of the three local golf courses; Fairchild Wheeler is a very short walk away. In fact, the street gets its name because this land was once a putting green. In the early days of their time there the current owners said they often found golf balls when working in the gardens. Shops and restaurants are nearby in Stratfield Village and along Black Rock Turnpike. For commuters, the house is only a mile from the Merritt Parkway and not far from I-95, downtown Fairfield and the train station. The eight-room house has a natural wood-colored exterior with Williamsburg colonial green trim. Enter the house from the long covered front porch. The open floor plan of the interior was designed to have flexibility of use. The front door opens directly into the formal dining room but it could be used as the living room instead. The formal living room has built-in cabinetry and shelving, and tongue-in-groove wide-planked hardwood flooring with 18th century nails. All the rooms have oak flooring with five coats of polyurethane. The living room also has a wood-burning fireplace with an energy-saving heatilator, which can heat up several rooms. The dining room has wainscoting on the lower walls, as does the family room. The country kitchen features a vaulted ceiling with 350-year-old exposed beams reclaimed from the rafters of a village house in Massachusetts. It has a large angled center island topped with beveled quartzite. The perimeter counters, also quartzite, has pencil point edges. The backsplash comprises glass tiles in nautical colors. Also found in the kitchen are ceramic tile flooring, cherry cabinets with roll-out pantry shelves, under cabinet lighting, eat-in area, stainless appliances, a skylight, and a dry bar area with a stained glass window. A floor-to-ceiling brick wall houses the range and microwave. At the back of the kitchen there is a door to the back yard and the flagstone patio. This part of the house also has a utility closet, pantry closet, and coat closet. From the kitchen there is access to a half bath and laundry area. On the other side of the dining room there is a wing with a marble full bath and two bedrooms, one of which is the master. The other is used as an office. These rooms could be used to create a larger master or a large walk-in closet with a dressing room. Two more bedrooms and a marble bath are on the second floor. The pickets on the railings of this staircase match those of a Sasco Hill mansion that once belonged to a relative of Jacqueline Kennedy. Both bedrooms have window seats, one of which is a cedar chest. The hallway has built-in storage baskets with doorknobs that replicate branches and acorns. The home’s updated baths have seamless glass showers. The oversized, attached two-car garage can actually fit a third vehicle - a small sports car. It also has an alcove with a workbench/workshop area. There will be a public Open House on Sunday (August 27), 1-4 pm. For more information or to set up an appointment to see the house, contact Liz Eckert of Coldwell Banker Residential Brokerage at 203-451-4300 or liz.eckert@coldwellbankermoves.com.